September 20, 2017 — ProCure Proton Therapy Center in Somerset, N.J., recently celebrated the five-year cancer-free milestone for the first group of prostate cancer patients treated at the center after it opened in March 2012. At the time, it was the 10th proton therapy treatment center in the United States, welcoming patients with various cancer types that could benefit from this advanced form of radiation therapy. Prostate cancer is the most frequently diagnosed cancer among men in the United States other than skin cancer, according to the American Cancer Society, and about one in seven men will be diagnosed at some point throughout his lifetime. September is Prostate Cancer Awareness Month and ProCure Proton Therapy Center New Jersey urges men of all ages to learn about the factors that can increase their chances of getting prostate cancer and familiarize themselves with treatment options that are available to them. Over the past five years, ProCure Proton Therapy Center New Jersey has treated over 3,000 patients and embraced a culture of patient-centric services where patient needs and comfort are paramount. Patients Bob Jones and Peter Van Drumpt were among an early group of prostate cancer patients to be treated at the Center. Like many patients who walk through ProCure’s doors, these men were drawn to the Center for its innovative technology and the staff’s passion for the well-being of patients. Now, five years later, they remain prostate cancer-free and maintain their quality of life. “Looking back at the time I spent at ProCure, I’m extremely happy I made the decision to undergo proton therapy for prostate cancer treatment. Five years later, I’m still reaping the benefits from proton therapy and, because of my experience at the Center, I’m now an avid patient ambassador. It’s my hope that I can help other men in the same way that ProCure has helped me,” shared Jones. Van Drumpt also recalls that while determining which treatment was best for him, the process was overwhelming. However, discussing his options with ProCure physicians and former patients was essential to making his important health decision. “It was tough deciding where to begin since there were so many resources online about prostate cancer treatment options. It was a relief to have the support of ProCure team members as well as the ability to gain helpful insight from patient ambassadors on their experience with the treatment as I embarked on my own journey.” Van Drumpt shared. In honor of Prostate Cancer Awareness Month, ProCure Proton Therapy Center New Jersey encourages men to be cognizant of what may put them at risk for prostate cancer. Factors such as being older than 50 years of age, having an immediate blood relative who had prostate cancer, or being of African American descent can put men at higher risk for getting prostate cancer. 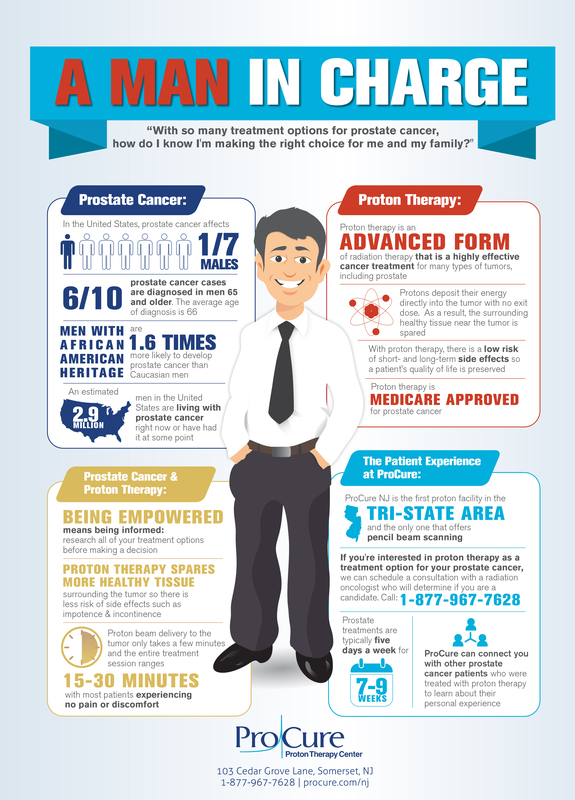 The Center offers an infographic on prostate cancer and proton therapy that can serve as a resource to help men take charge of their healthcare decisions that can be downloaded here.